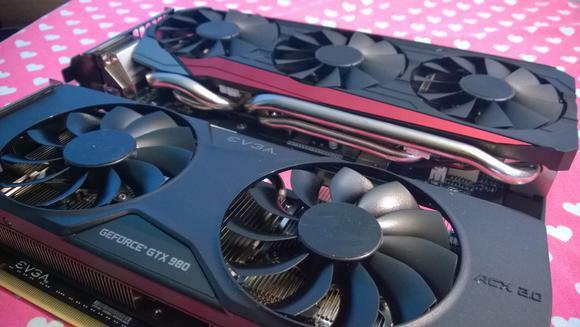 The AMD Radeon R9 Fury flew past the stock GTX 980 in benchmarks. How does it compare against a similarly priced custom version? Why didn’t you test the powerful Asus Strix Fury against a custom-designed GeForce GTX 980 graphics card? That was the question droves of commenters posed after the first round of reviews for AMD’s air-cooled beast hit the Interwebs. The vast majority of the initial comparisons pitted a reference GTX 980 versus AMD’s Fury, which only sports aftermarket cooling designs. It’s a valid question, with a simple answer: All the test GTX 980 graphics cards Nvidia sent to reviewers were stock models. Fortunately, one of the readers pondering the question happens to work for Nvidia. One brief discussion and a few days later, a shiny new EVGA GeForce GTX 980 FTW with ACX 2.0+ cooling appeared on my doorstep. So now we have a more direct head-to-head comparison: A custom-cooled GTX 980 and a custom-cooled Radeon Fury, each with an MSRP of $580. Fight! Actually, there’s a slight spoiler (that isn’t really a spoiler) to this fight before it even starts. While the EVGA GTX 980 FTW’s MSRP is $580, you can find it on the streets for $500 to $530 depending on where you look. The Strix Fury is still so new that it costs a full $580—when you can find it at all. Fury (and Fury X) graphic cards sold out almost instantaneously, and appear to be facing supply constraints. You’ll be lucky to find one at retail. Still, they’re what we have, so let’s do this. Asus’ Strix Fury starred in our full Radeon Fury review. It boasts a cut-down Fiji processor consisting of 3584 stream processors, 4GB of bleeding-edge high-bandwidth memory and a 1000MHz core clock. More importantly for this test, it also packs Asus’ DirectCU III custom cooling system, which is loaded down with a trio of low-noise fans and approximately a metric ton of metal heat sinks and pipes. Seriously, this card is big—but that beefy cooler helps the Strix Fury run whisper-quiet, despite Fiji’s tendency to run hot. The Asus Strix Fury's DirectCUI III cooler. 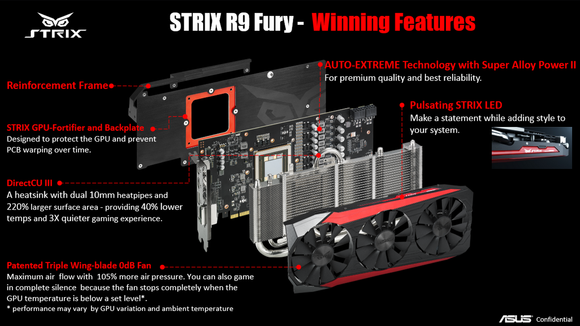 The Strix Fury soundly topped the stock GTX 980 in our initial review. The only benchmark Nvidia’s card won in was Grand Theft Auto V. Otherwise, it was a clean sweep for the Fury—and the results weren’t even particularly close in most games. So in this corner, there’s EVGA’s GeForce GTX 980 FTW with ACX 2.0+ (whew! ), which is basically the GTX 980 on ‘roids. It packs the same core specs of the base GTX 980—2048 CUDA cores, 4GB of GDDR5 RAM, et cetera—but with one key change: Clock speeds. The 1279MHz base clock of the 980 FTW is far higher than the base 980’s boost clock, and the 980 FTW’s own boost clock goes all the way up to 1380MHz. Whoa. And the overclocking results are even crazier—more on those later. 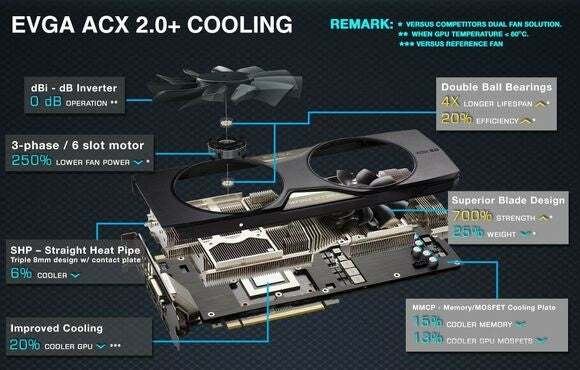 Details about the EVGA GeForce GTX 980 FTW's custom ACX 2.0+ cooling solution. The 980 FTW rocks EVGA’s sleek ACX 2.0+ custom cooler, which we’ve seen before on the GTX 960 and ferocious GTX 980 Ti . Rather than talking about its dual fans, custom heat pipe, MOSFET cooling pipe, and quiet operation yet again, here’s an EVGA-supplied diagram showing it all. Continue to the next page for Radeon Fury vs. GTX 980 performance benchmarks.